Among all the desserts today, like cakes or pies, we can say that a cookie is the least complicated to do. But do not underestimate it because the art behind making pressed cookies is like no other! With its intricate shapes and the detailed designs, you may think that these cookies cannot be done manually but with the help of cookie press, it is possible. A cookie press is a kitchen equipment that is used for making pressed cookies. It is cylindrical in both shape and form that comes with a plunger on one end. The plunger extrudes cookie dough through a small hole at the end. You can find perforated plates that are interchangeable in a cookie press. These plates come with holes that vary in shape. Some of the most common shapes are a star and narrow slit in which dough is extruded like a ribbon. Also, a cookie press can either be electric or manual. The latter is cheaper to buy and offers a lot of variety in it. If you find cords to be a bit of a hassle, then a manual cookie press should work for you. The other advantage of a manual cookie press is that it allows you to press heavier doughs as you can modify your preference regarding the pressure that you need. Meanwhile, an electric cookie press can give you a more consistent pressing which is essential and ideal in this craft. 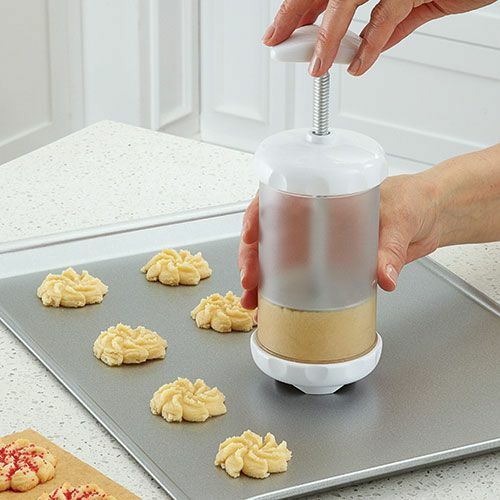 This type of cookie press outshines the other one as it lets you save more time, too. Ultimately, both of these types can press cookies and decorate your desserts. The cookie press manual is included for a reason — you have to allot time and read it thoroughly first. After that, attempt to make use of the device until you get the hang of it. Remember, that while the process in knowing how to use cookie press is easy and quick, it will still take time before you master it. There are ingredients that you need to avoid and not include at all when using a cookie press. Some of these include nuts and raisins, which by the way, cannot be pressed thoroughly. But a vegan chocolate is okay. After all, chocolate in cookies is always a good idea! Ensure that you follow the recipes religiously as your dough has to be soft and should have that particular consistency. Always go for a bare baking sheet. As such, try not to use parchment paper. In this way, your pressed dough can adhere to your cookie to get a proper form. Make certain that you’re able to remove air by pressing it a little. Also, bring the dough or icing near the disk or tip. When you’re filling the shaft, you can press it down while adding dough or icing. You should be able to tell the shape of pressed cookies right after you bake them. As such, you’ll fill them in with too much once you overload them, resulting to a rounder cookie. Before you lift the press and move on to the next cookie, wait for a second after you stop the press action. It should allow the dough that is now released to grab the cookie. Also, you are bound to have less “strings” to place in the bowl again. Allow to space your cookies for just about 1-1/2 inch or so. These cookies rise but not that much as with other cookies. As these cookies are most fragile right after you bake them, try to cool them first before removing. It is also best that you wear baking mitts when handling the baking sheet to prevent unwanted injuries while making these cookies. A thinner, metal cookie spatula is best needed for you to remove them efficiently. Know that while your sheet is not greased, these cookies may seem to be sticking but will eventually come off. Your cookie press consists of many parts, some of them have small parts. To avoid losing them, it is always best to clean it by hand-washing. Dry it off completely before storing. 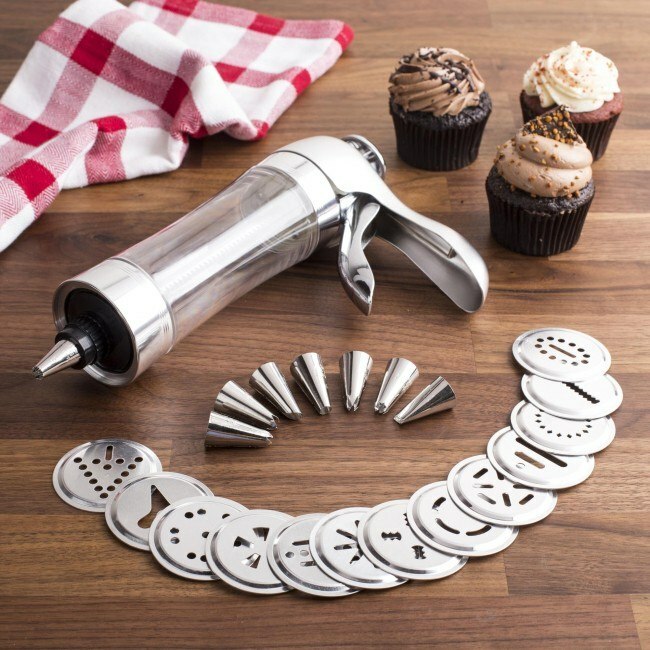 Your cookie press needs to have more discs if you just want to make some cookies. However, go for a variant that features an excellent assortment of discs and pastry tips if you want to decorate your cookies with icing. The variant’s quality must always be checked along with its shaft that should attach quickly and securely to its handle. If you don’t like the duty of refilling your cookie press, then consider one with a larger capacity. It should also give you a larger tube to hold. Go for a form and a handle that are easy to handle. There are cookie presses that are prone to rust. As much as possible, avoid models that may rust over time. It could quite be a challenge to get rid of all the dampness from the grooves when they get washed off. If your hands find the “hand plunger” type a bit problematic, go for the turning style manual press along with an electric model. 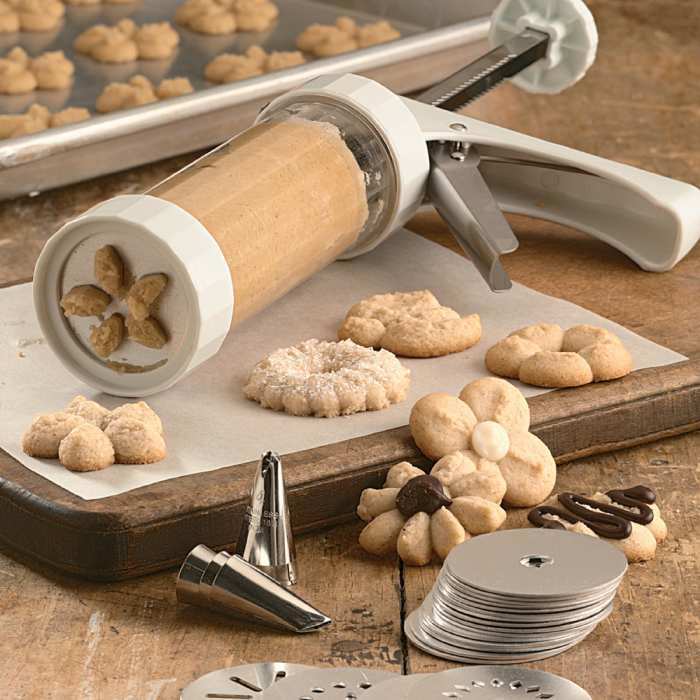 If you have a kid, who is into using cookie press as well, buy him or her a variant that has a smaller shaft. 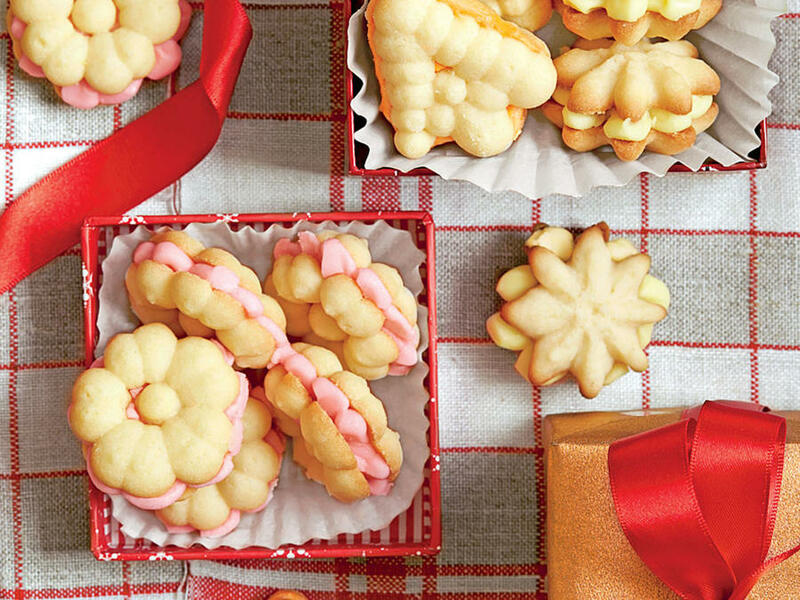 This mistake-proof wonder is also adept in perfecting cookie shapes all the time. It has a feature that creates consistently shaped cookies and a non-slip base that should keep your cookie press steady as you dispense your output. Meanwhile, its comfortable design has a large, non-slip lever that is specially developed to cater to a kid-friendly, comfortable, and constant usage. This shouldn’t strain your hands even you make dozens of cookies. To top that off, your cleaning up won’t be a struggle as the device just disassembles easily while you load and tidy it up. The other perks you’ll get from this entry is its 12 stainless steel cookie disks that are provided in varying patterns. They include the favorite Snowflake, Daisy, Flower, Fleur-de-lis, Butterfly, Tree among others. And this so beautiful like wafer. When ease and fun are combined in cookie pressing, you get the Marcato Atlas Deluxe Biscuit Cookie Press. The product just makes baking cookies a lot easier and lighter, if one must say. You can just select your desired shape and fill it with the dough as you press the handle and voila! A freshly-baked, nicely-shaped homemade cookies are out. This biscuit maker has 20 disks that are designed with traditional cookie shapes. Meanwhile, its ease just doesn’t end with its general shape and form; this entry is also neater than using cookie cutters. You can also disassemble the device for easy clean-up. And as it is made with stainless steel, expect durability and longevity on this equipment wonder. The Wilton Cookie Pro Preferred Press is a testament that a product in this segment can achieve comfort and ease at the same time. But its most hallmark feature doesn’t reside in this but rather it’s provided with its attempt to bring everything on the table — and it delivers! 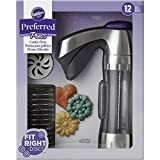 From its add-ons like the 12 excellent shapes and the four mini cookie designs down to its complete instructions and scrumptious cookie press recipes, this contender is bringing it! The entry from Wilton also boasts of a non-slip bottom ring that keeps the press from sliding on your cookie sheet. Meanwhile, its proprietary Cookie Pro Ultra is specially included to make your filling experience the easiest along with its most comfortable press among its competition. 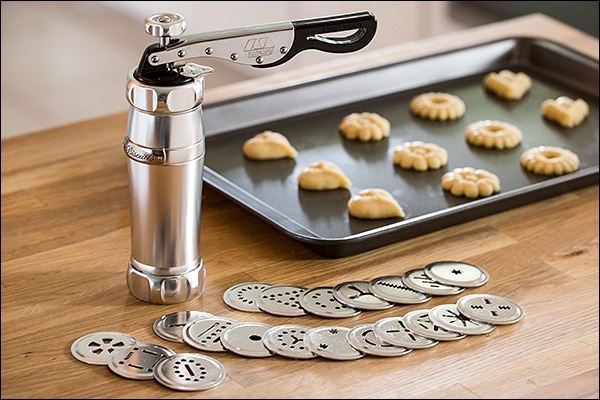 Whether you’re using your left or right hand or whenever you’re ambidextrous, the Kuhn Rikon Clear Cookie Press’ stainless steel trigger mechanism will allow you to use it easily with only one hand. It has a see-through plastic barrel that enables you to determine quickly how much of your contents are left. This kid-friendly tool also has 14 interchangeable disks and included recipes. Meanwhile, Kuhn Rikon’s tube can hold dough for up to 30 cookies. The entire form also comes apart easily so you could clean it without hassle. Cuisinart’s only entry in the bunch offers more features than its predecessor. You can get 18 design disks and six decorating tips. These tips include the how-to in filling deviled eggs and pasta shells. 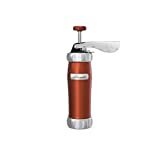 It has a simple yet efficient mechanism that allows you to fill the clear tube with dough and press the handle to make cookies in batches without that often-encountered hassle. On the other hand, the dishwasher-safe product has the brand’s limited lifetime warranty and the much-need recipe booklet that some of its rivals are not able to offer. The Marcato Atlas Deluxe Biscuit Maker Cookie Press and the Wilton Cookie Pro Preferred Press are evident even at first glance that they are both standouts in this competition. However, Wilton’s entry trumps Marcato’s, although slightly, due to its complete package that works. 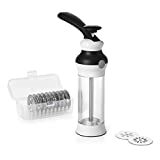 It consists of everything that you need from a best cookie press, from its included recipes to its proprietary Cookie Pro Ultra, this product is a definite winner. 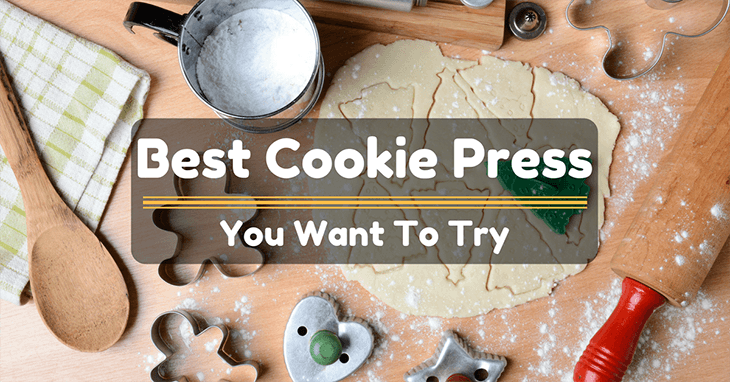 If you think another product deserves a spot on our list and you just want to share with us your experience with your first cookie press, please feel free to sound them in the comment section below. Enjoy cookie pressing!